Branded movies that have been released between January 1, 2018 and March 31, 2019. Submissions must be videos produced with the aim of communicating the brand or services of a company/organization to its customers. The company/organization can be part of any industry. The movie can be submitted by any relevant party; the company/organization it was produced for, the advertising company, the production company etc..
1. In order to promote Short Shorts Film Festival & Asia and Branded Shorts, selected works may be screened/streamed at events or via websites operated by the Committee for Short Shorts (operations company: Pacific Voice Inc.) or other third parties involved. 2. The Entrant Company has to receive approval from all related companies. 3. To avoid conflict with the aforementioned stipulation, please ensure that the individual rights relating to writers, performers, musicians etc. have all been cleared in advance before submitting. 1. More than one branded movie produced for the same campaign may be submitted as one entry. 2. If submitted work is in a language other than English or Japanese, please submit and English or Japanese script or dialogue list. 3. Refunds will not be offered under any circumstances. 1. Fill in an online entry form. We will send a confirmation email with the submission number to your email address. ※ Please note that zipped file should be named as the submission number provided in confirmation email. 3. Pay for your submission. There are two ways to pay the entry fee; PayPal or wire transfer. Out of the nominated works, jury members from various backgrounds will select the Branded Shorts of the Year. 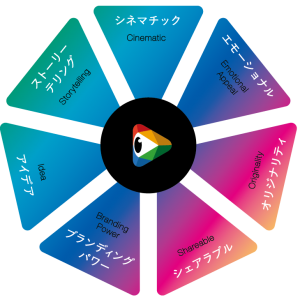 With their philosophy “make movies a communication medium”, specializing exclusively in cinema related advertising and promotional opportunities, SUNRISE Company Limited together with BRANDED SHORTS, will present the SUNRISE CineAD Award to the most cinematic branded movie.